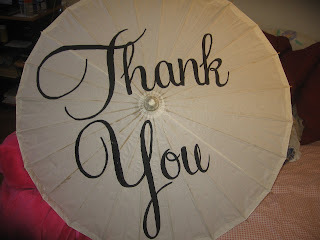 The DIY Bride: Thank You Parasol - Check! I absolutely fell in love with this next project, and constantly argued with myself back and forth about doing it or not. I was worried about whether I could do it or not, or if I would mess it up! But I decided to give it try and hope for the best. And here it is.. ! I did it! YAY! Haha now onto my directions for making one of these bad boys for yourself! 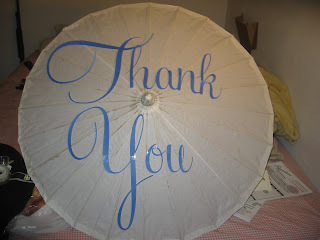 White Parasol - The one I bought is 32" in diameter. Black Sharpie - I used a fine tip sharpie pen. 1. Create a 25x25 document in Microsoft Publisher. Insert two text boxes, one for each word. 2. 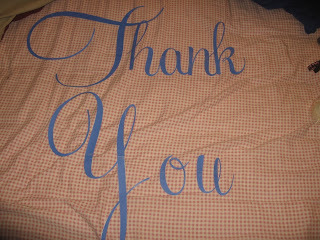 In the text boxes, write "Thank" in one, and "You" in another. Then, enlarge the text to 700 and bold it. Then, choose which font you would like to use. 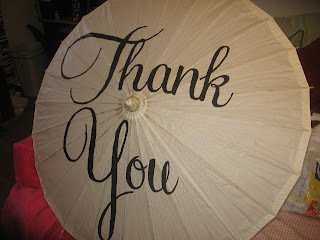 I wanted to keep the same script for the parasol that I have used on all of my other wedding stationary, which is Feel Script. You can use one text box if you prefer, but I found that by having them separated, I could make the words fit better into the document. 3. Print off your document, and organize it like a puzzle. As you can see, I turned my "You" upside down in the document to make it fit better. 4 . Now comes the time consuming part, cut out all of your letters and tape together the portions that became separated when printed. 5. 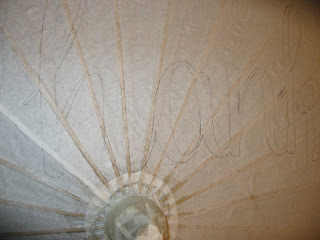 Open your parasol, and lightly tape the stencil onto your parasol. 6. Using your pencil. 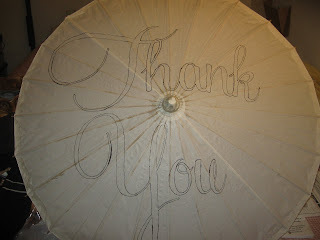 trace the stencil onto your parasol. Don't press too hard, as to not rip the parasol. 7. Using your sharpie, trace over your pencil. I used a Sharpie fine-point pen because I found that a thicker Sharpie has a larger tip and smears a lot more than the Sharpie pen. 8. With your black paint and small paintbrush, paint the letters. If you mess up a little, don't fret! You can fill in some minor odds and ends with your Sharpie. Looks great! This was my least favorite DIY project. It was pretty time-consuming. 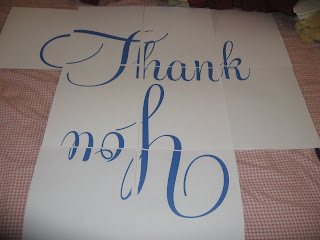 I found it to be a pain at times to cut out all of the letters for the stencil. I'm so glad it is done though! I love how it turned out!